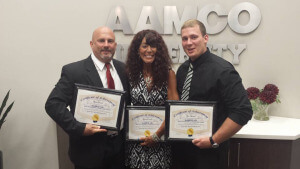 AAMCO’s service center in Fort Pierce, Florida, located at 3821 South Highway 1, has a new owner. The Fort Pierce service center features 11 bays and is open from 8 a.m. to 5 p.m., Monday through Friday, and from 8 a.m. to 1 p.m. on Saturday. The new owners, Kurt and Donna Caruso, along with their son Joe Caruso, are closely involved in the local community and are members of the St. Lucie County Chamber of Commerce. While this is the family’s first franchise, Kurt Caruso has always had a passion for cars, and previously owned a used car lot and towing business in Pennsylvania.